In winter weather, outdoor activities become rather limited--no parks, lakes, swims, bike rides, picnics. Therefore one of our favorite date activities in the winter time is the theater (even at home in Seattle) where you can be indoors. We love it all-- plays, musicals, concerts, ballet. 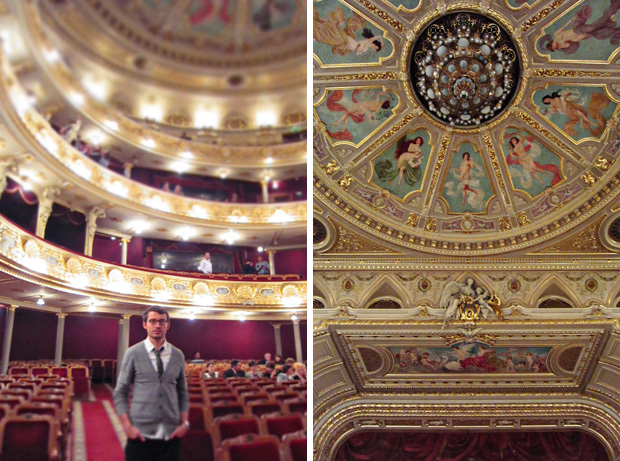 The Lviv Theatre of Opera & Ballet is a gem. We were surprised to stumble upon such a beautiful and sophisticated building. Like we already mentioned before, the expectations we had for our home country were very low (probably because of how our parents talked about it). When we went inside to inquire about shows, my jaw dropped when I heard that tickets were just $5! We were in Vienna just a week ago, where tickets were $50-200. We bought two tickets for that same evening without a second thought. The show was called "Запорожець за Дунаем" or "Beyond the Danube", a traditional Ukrainian opera that premiered in 1863 and takes place in the Kozak period. Girls had long braids, colorful skirts, blouses with balloon sleeves, headdresses, and folksy embroidery. Men wore sharovary (wide trousers), cloaks, and interesting haircuts. Everyone was in boots. Yuriy and I were so happy to hear the songs and see the traditional dance and dress of our home country. A date isn't a date without a meal. 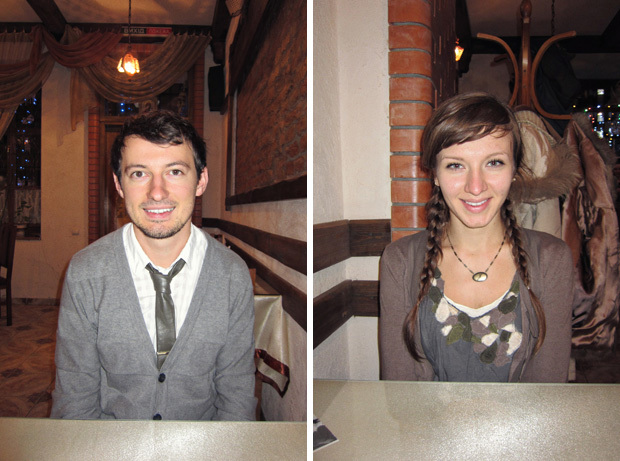 Eating our favorite Ukrainian food after a Ukrainian show couldn't have been more perfect. We snuck in a little video when no one was looking! This place is aaaaamazing! You two are so lucky to have had the chance to go see in an opera in an old old building! Love the coat check tokens! Yes in France we have a lot oh theater like this, my city is very small but has a place like this too, i enjoy them, very pretty. Amzing photos and amazing place! I am so proud and so glad that you really like this city! It is beautiful! keep waiting for new posts from you! Wow these are stunning! The decor is so ornate. a very beautiful building inside and out. how fun to able to see this opera! I love this! Everything about the place is gorgeous. I love the red color of the velvet seats against the cream and gold walls. Magnificent.